The Doctor Who and the Dalek Invasion of Earth audiobook has been delayed by two weeks: it will now be released on July the 2nd. Dozens of titles have been added to our database of forthcoming releases, Incoming, in the last few days, so please spend a minute or two checking it out. My thanks to Graves for all his hard work. Ernest Borgnine will be signing copies of his autobiography, I Don't Want to Set the World on Fire, I Just Want to Keep My Nuts Warm!, at The Cinema Store (Unit 4b Orion House, Upper Saint Martin's Lane, London) on Friday, at 2pm. More details here. Buysoundtrax has announced the CD release of Mike Vickers' score for Dracula AD 72, as a limited edition of 1500 copies (current market trends suggest that this is likely to sell out very quickly, perhaps within a couple of days). The company is taking pre-orders now, and the disc will ship on May the 4th. Let's hope that this might lead to further soundtrack releases by Vickers - At The Earth's Core and Warlords of Atlantis would be very welcome! Recent additions to the Incoming database include: Oscar-nominated drama Revolutionary Road, on DVD and Blu-ray; the eagerly-awaited Blu-ray edition of Star Trek - The Original Series - Season 1; the Blu-ray box set of the first six Star Trek movies (the ones featuring the original series crew), Star Trek - Original Motion Picture Collection; new collections of episodes of ITV sitcoms Surgical Spirit and Two's Company, from Network; Kiwi zombie comedy Last of the Living; Jean-Claude Brisseau's provocative The Exterminating Angels (postponed from February); the first season set of 60s Coronation Street spin-off Pardon The Expression, which stars Arthur Lowe; the first season of fondly-remembered ITV sit-com The Cuckoo Waltz, which stars Diane Keen and Lewis Collins; the 2003 version of The Lion In Winter, which stars Patrick Stewart and Glenn Close; Barry Levinson's satirical Hollywood comedy What Just Happened; indie movie How To Be, which features Twilight's Robert Pattinson; fantasy movie Dragon Hunter; ITV drama Compulsion, which starred ER's Parminder Nagra and Ray Winstone; Blu-ray Special Editions of Trainspotting and Shallow Grave; and E4 sketch show Beehive. Sci-Fi London: The London International Festival of Science Fiction and Fantastic Film starts on Wednesday! Among the events is a all-nighter showcasing Italian horror movies Mario Bava's The Mask of Satan, Argento's Sleepless, Lamberto Bava's Macabre; and Mario Bava and Salvatore Billitteri's Black Sabbath. This is scheduled for May the 3rd. Details of the festival can be found here. Look out for DVD releases of Sleepless and Macabre, from Arrow Video, at the end of June. Recent additions to the Incoming database include the Blu-ray and DVD versions of Being Human (note that the Blu-ray version has additional features, but neither of them will include the original Pilot episode); the first season of The Sarah Silverman Program; the DVD and Blu-ray versions of Transporter 3, and the limited edition steelbook edition of The Transporter Trilogy (on DVD); horror film Shuttle; the fifth season of Two and a Half Men; the fifth season of The L Word; Sky's Easter family fantasy drama Skellig; Baz Luhrmann's epic Australia on DVD and Blu-ray (the Blu-ray includes a lot of bonus material not on the DVD); and the fourth American Dad set. I've also listed The X-Men Trilogy Blu-ray box set, which has an RRP of £39.99 (according to the press release), but all the etailers I checked seem to think it's got an RRP of £44.99, so be careful when you order it, to make sure you're going to get the best deal. The Living Daylights' Mayam D'Abo will be signing in the basement at the Vintage Magazine Store, in Brewer Street, London, between 12 and 2pm on Saturday April the 25th. Autographs will cost "about £15". More details at their website. 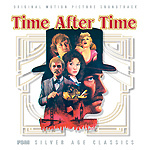 Film Score Monthly has released a fine new CD of Miklós Rózsa's full-bodied score for Nicholas Meyer's dandy 1979 time-travel thriller Time After Time (in which HG Wells pursues a fleeing Jack the Ripper to modern-day San Francisco). Rózsa's style of scoring was considered somewhat old-fashioned by the time Time After Time was released. Primarily associated with films from decades earlier, like Ben Hur and El Cid, Rózsa's lush romanticism had infrequently been employed during the 70s. A notable exception, which often sounds remarkably like Time After Time, is Rózsa's wonderfully exotic score for 1974's The Golden Voyage of Sinbad. The score has been available on CD before, from Australian label Southern Cross. It featured a re-recording of the score, made in London for the original Entr'Acte LP release in 1979. It was performed by a smaller ensemble than the more vibrant version, recorded by a sixty-piece orchestra, for the film itself (which is what's on FSM's new CD). In addition to offering superior stereo sound (taken from Warner's original sixteen-track two-inch masters), FSM's new edition adds about quarter of an hour of previously-unreleased music, including some material dropped from the film's final mix. It also includes a much longer performance of the soothing piano version of the Time Machine Waltz than the one that's heard only briefly in the film. I'll be honest, and say that, having become accustomed to the Southern Cross CD over the last twenty years, and having listened to it many, many times, the FSM CD has taken some getting used to. It sounds quite different, of course, but the earlier recording also took some liberties with the music, since it no longer had to be tailored to match the film. I'll certainly be hanging on to both versions, and both will be revisited often. Even by FSM's usual high standards, the CD's twenty-four page booklet is outstanding: a valuable memento of the score and the film itself. It features detailed track notes - perhaps a little more technical than usual - by Jeff Bond and Frank K DeWald, a concise history of the film's production, and, best of all, a lengthy personal memoir written especially for the new CD by director Nicholas Meyer, in which he explains his typically thoughtful and intelligent approach to the project, and recounts his working relationship with Rózsa. The disc, which is a limited edition of three-thousand copies, is available from the usual soundtrack specialists, including FSM's trading partners, Screen Archives Entertainment.